Ninety four people will be laid off. The library will be open only four days a week. Historic Forestville in Preston, North West Company Fur Post in Pine City, and Charles A. Lindbergh Historic Site in Little Falls will be closed to the public. The Minnesota Historical Society Press will reduce by a third the number of book titles it publishes each year. These are just a few of the layoffs and reduced services to the people of Minnesota that will result, beginning July 1, 2009, from the proposed 16% budget cuts that may be asked of the Minnesota Historical Society by the State Legislature and Governor Pawlenty. What follows is based on a press release by the Historical Society describing the proposed cuts. There will be further discussion of these cuts on this website in the days ahead. 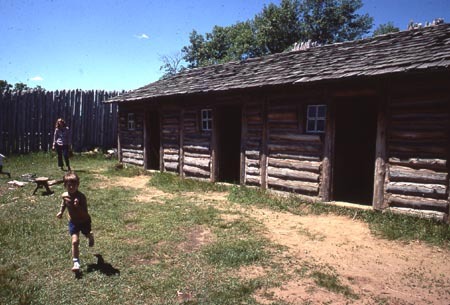 The North West Company Fur Post, pictured here in 1978, is one of the historic sites that would have to be closed under proposed 16% Minnesota Historical Society cuts announced on April 16, 2009. The plan for cuts, announced by the Minnesota Historical Society on April 16, is based on expected cuts in the Society’s funding from the state of Minnesota, as well as the effects of the current economic downturn. The reduction was developed in anticipation of serious budget shortfalls during the Society’s next fiscal year, which begins July 1. A final decision on the Society’s state funding levels is expected in late May when Governor Pawlenty and the Minnesota Legislature announce an overall state budget for the upcoming biennium, which also begins July 1. Since October, 2008, the Society has been engaged in a comprehensive strategic planning process. This process provided guidance in developing the proposed budget reductions. The planned budget reductions would result in less public access to the Society’s services, programs and facilities. It also would affect the Society’s work to preserve the state’s history. Layoffs would occur for 94 full- and part-time employees, and an additional 223 employees would have their hours reduced. In total, 317 individuals would be affected, or 46 percent of the Society’s staff, including individuals that work directly with the public, as well as people that support public programs and preservation statewide. Under the 16-percent reduction plan, the Society anticipates cuts in all of its major service areas. Reductions would occur at the Minnesota History Center in St. Paul. Access to the library would be reduced to four days per week, limiting use of the Society’s vast collections. The Society’s Reference and Collections departments would merge. The Minnesota Historical Society Press would reduce the number of books it publishes annually by about 30 percent. Reductions also would occur in functions ranging from collections, reference, conservation, marketing, curatorial services and exhibitions, to institutional support areas such as finance and human resources. Another view of the interior of the North West Company Fur Post in Pine City, which would be closed under a proposed 16% budget cut. Under the plan, access to historic sites would be reduced statewide. Three historic sites would close on July 1, but would continue to be maintained and preserved by the Society. They include: Historic Forestville in Preston, North West Company Fur Post in Pine City, and Charles A. Lindbergh Historic Site in Little Falls. 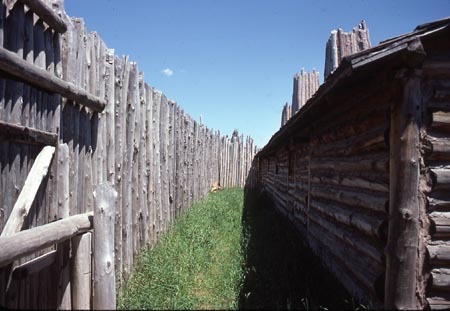 Public access to Historic Fort Snelling would be reduced from seven to five days per week except for prearranged group tours and school field trips. Four sites would be open to the general public on weekends only with service during the week limited to prearranged group tours and school field trips. These sites are: Oliver H. Kelley Farm in Elk River, Mille Lacs Indian Museum and Trading Post in Onamia, Forest History Center in Grand Rapids, and Jeffers Petroglyphs in Comfrey. Access to the Sibley House in Mendota would be limited to special events and prearranged group tours. Alexander Ramsey House in St. Paul would be open only during the November/December holiday season. Mill City Museum in Minneapolis will be closed on Thursday evenings. Timeframe Following the announcement of the state budgetary decisions in May, the Society will finalize its reduction plan and make a formal announcement. Until an announcement is made, all historic sites, museums and programs will remain in full operation and open to the public. Current hours and services are listed at www.mnhs.org.